I was chatting with a new friend the other day who mentioned she had seen my blog and now she wants to come see my house, since it must be awesome. I was flattered by her comment, but I giggled a bit because my house is by no means awesome. Sure, I like my kitchen since the budget redo last summer, and my front room has a cool photo wall, but it also houses my husband’s bike most of the time along with bunches of other stuff, including a fairly thrashed, super cheap bookshelf that I stole from my sister when we lived together in COLLEGE. That would be about 15 years ago. (Dear Shelby, I also have your ironing board from college. And I still use it. Dad would be proud.) Add to all that the fact that there’s seven peoples’ worth of stuff crammed our relatively small home and no, it’s not actually awesome. I kind of like it. 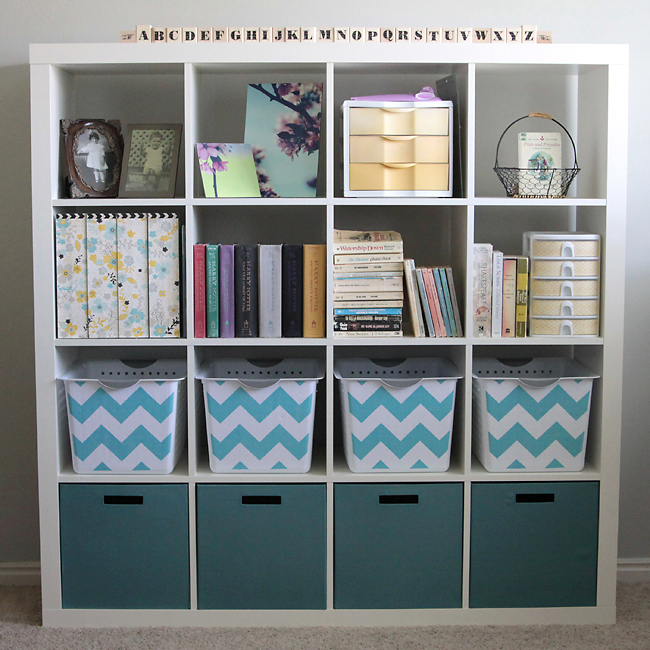 The fabric bins on the very bottom are Target ITSO brand, then the chevron ones are cheap sterilite bins covered in fabric. Then I filled up the other spaces with 12×12 size paper/magazine holders (flowered), two sets of sterilite plastic drawers, favorite books, old photos, and some insta-fied flower prints. 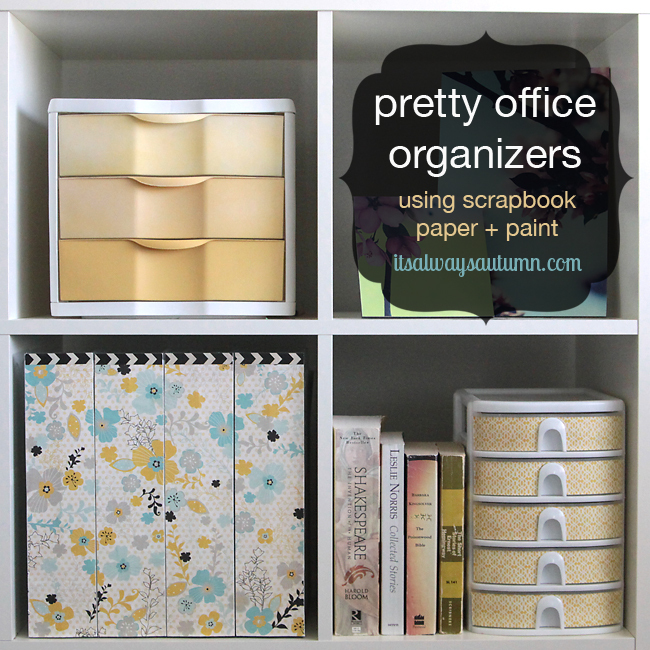 Next came the small plastic drawers, which were also covered with scrapbook paper. This time I used spray adhesive, just to see if both Mod Podge or spray adhesive would work, and they do. 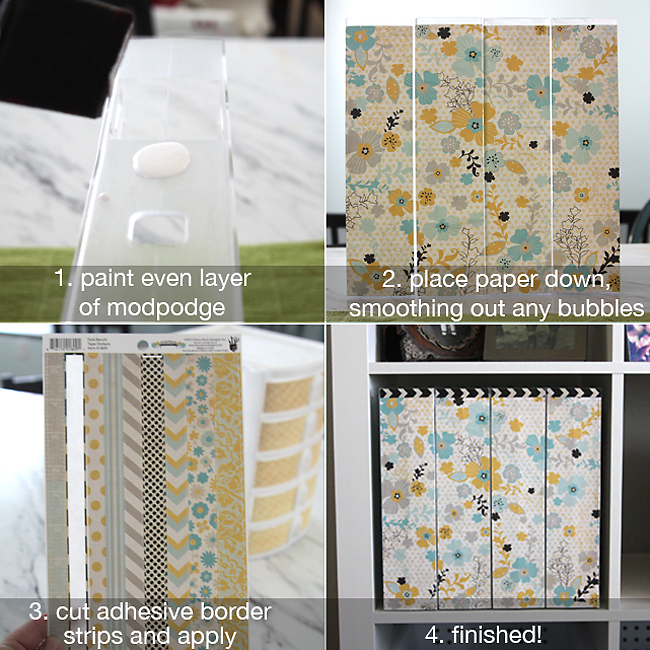 FYI – the pretty paper I used was from Fancy Pants’ Park Bench line. I think it’s really pretty now (when my daughter hasn’t pulled all the books and bins off – luckily she leaves this stuff alone most of the time). So no, my house isn’t awesome, but maybe this little part of it is. Thanks! i love how this looks to make it cute with paper!! I really liked the idea of the plastic drawers . Though it seems a little bit awkward but still it works. We can have many color options and this would be really a great thing to the geek like me. Oh my goodness, GORGEOUS. I like your sense of pattern and symmetry (something I am sorely lacking myself, LOL). 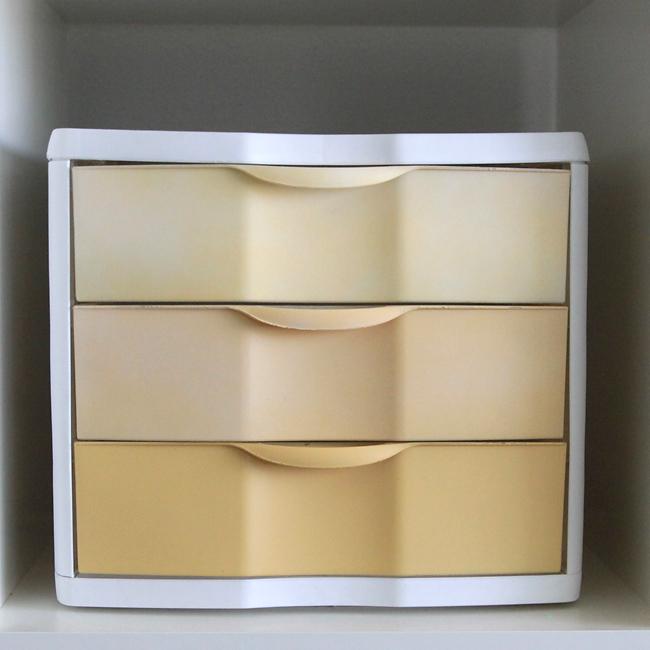 What colours of paint did you use for the ombre effect drawers. I love the golds. Hi Ronnie! I found a gold spray paint that I liked, which is the color of the darkest drawer. For the other two drawers I spray painted them white first, then went over them with the gold, trying to just “dust” the spray paint on. I think for the lightest drawer I actually ended up adding a little more white paint to get it very light. HTH! 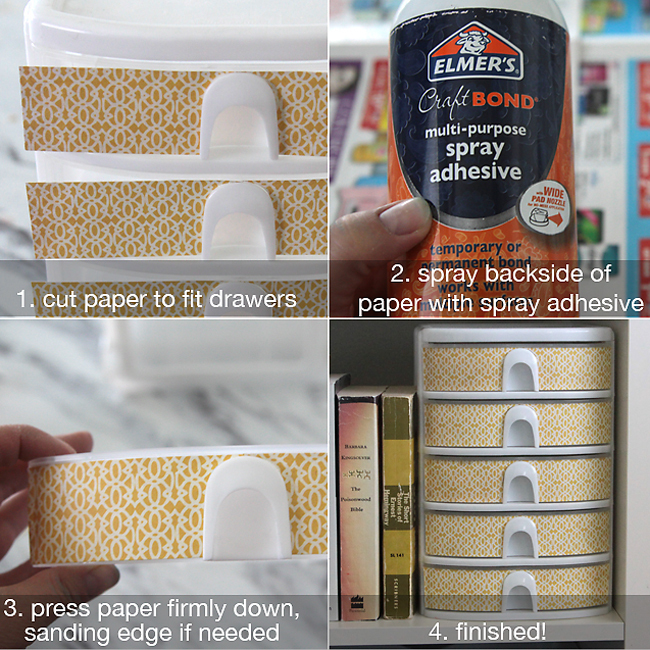 Very CLEVER ways to cover our beloved plastic storage containers!!! I used to do a lot of crafts when my sons were little and with working full time I got away from it. Thank you for giving me a jump start! I love your ideas!!! I love these ideas! I almost gave my plastic bins to the goodwill because they were so old. Now I’m going to keep them and give them a new look! Thanks for the amazing ideas! Oh so cute,will start on mine ,thanks ever so much!